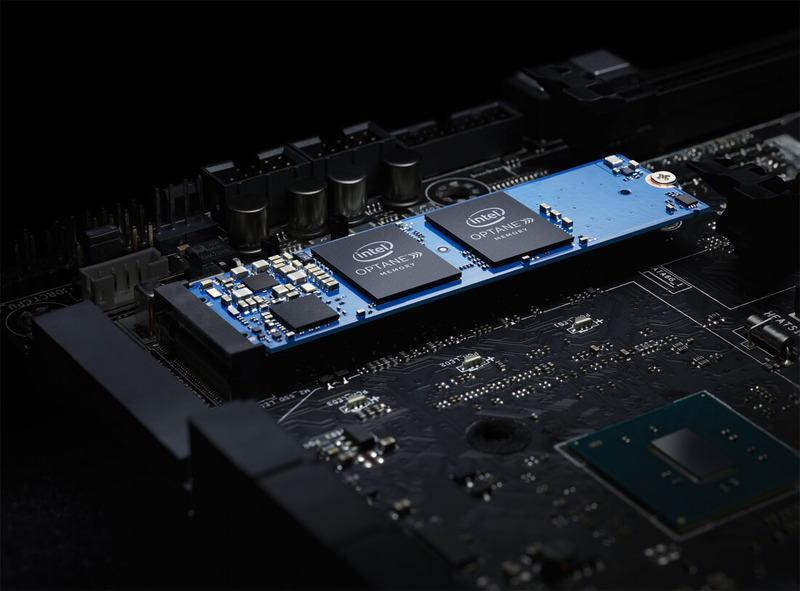 Following the release of their first Optane-based data center SSD, Intel has now announced a consumer friendly followup to their next generation storage solution. Intel and Micron jointly developed 3D Xpoint, branded as Optane, to bridge the gap between DRAM and NAND. While DRAM is fast, it's also volatile, and will lose data when powered down. NAND memory retains its data without power, but can't match the speed of DRAM. Optane is a new storage solution that promises to be non-volatile, and maintain high performance. The consumer version of Optane will be available for purchase on April 24 in 16GB and 32GB versions initially. They will cost $44 and $77, respectively, which is several times more expensive per gigabyte than traditional high end SSDs. That price will buy you a rated sequential read speed of (up to) 1350 MB/s, and a random read speed of (up to) 240000 IOPS. The 32 GB version also boasts a read latency of just 9 µs, and a slightly less impressive sequential write speed of (up to) 290 MB/s. Although the speeds are several times faster than current generation consumer SSDs, there is a major caveat: the consumer Optane drives can only be used as cache drives. You will not be able to install Windows or your favorite apps directly onto the drives. Instead, the SSD will act as a buffer for commonly accessed data and improve access speed. Intel claims a 2x faster boot time, 28% faster system performance, 65% faster game level loads, and that applications like the Chrome browser may launch up to 5x faster. In order to use the first wave of Optane SSDs, you will need to be running Windows 10 with Intel's latest gen Kaby Lake processors and a supported 200 series motherboard chipset. I think you meant to say: "The 32 GB version also boasts a read latency of just 9 µs, and a slightly less impressive sequential write speed of (up to) 1290 MB/s." It will be interesting to see how long it takes for these to be designed into the next generation of mother boards. Actually it looks like it says 290 MB/s on intel's website. By time I get around to buying one of these they'll cost a few measly bucks and maybe, just maybe, I'll have a system by then that will support them. MonkeyBoyX8000 and Odium like this. Look for new slim laptops that boot in three seconds from a cold start that use Optane as "cache". These won't be cheap as the extra component adds complexity and may reduce overall reliability. Only time will tell. When Optane, or it's equivalent, fully replaces RAM and storage drives, we'll have a complete next-gen, likely great, system. This should will take a couple more years and may not be cost effective. But, it will be awesome. Soooo its not really a hard drive but acts like ram memory? For those wondering... it's just a smart cache, similar to what you find in an SSHD. if you already have a good SSD or an NVME SSD then this is pretty much useless. Ugh. ffs Intel. this sounds like it wasn't ready for release yet and they pushed it through. I was looking forward to something far better.... I understood it would be faster, cheaper, and more capacity.... act as RAM and/or storage. I figured that we would have to wait for some other drastic changes to system architecture before we could have this tech. this feels more like a transitional product. not the actual 3D Xpoint. They have taken their queue from Microsoft. Sell it to the world and let them be the beta testers. Another in-between product like Win 95, Win ME, Windows Vista, Windows 8. Hang on a tic.... DRAM? That is memory. Sooo... This is a cache, which memory pretty much is. It says PCIe 3.0 x2... Why not x16 or x8? If something were to be accessed, wouldn't it have to go from SSD storage, to this thing, to memory to processor? You are adding another step into the process. Unless this thing is meant to bypass system RAM, I think it's pointless. Why would I want to take up an M.2 with a 32GB "memory" module when I could just have more system RAM or spend more for a blazing fast SSD? You can RAID 0 - 2 Samsung 960 EVOs and get (IMO) as good if not better performance. Faster booting? My system boots in 7 seconds, how much faster can it be?! Also notice the MBTF says 1.6. 1.6 what? Minutes? Hours? Million Hours? Talk about half assed. Then we can call it super speedy? there is samsung 960 pro available at cost of around $0.78 per GB with speed of wuth read speed upto 3500 MB/s and write speed upto 2100 MB/s. This is just a first step, once motherboards and OS's are designed to eliminate RAM it will shine. Think about that. 32GB of RAM for $44!